It’s hard to judge convention speeches when you’re a partisan yourself, but it sure seems as if Democrats have the better of things this year on the rhetorical front. 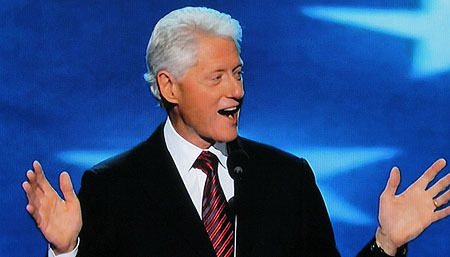 Yesterday Michelle Obama gave probably the best speech a first lady has given since Eleanor Roosevelt, and tonight Bill Clinton gave one of the best speeches he’s ever given. That’s a pretty high bar. total mess. He hasn’t cleaned it up fast enough. So fire him and put us back in. Now, there were two other attacks on the president in Tampa I think deserve an answer. First, both Gov. Romney and Congressman Ryan attacked the president for allegedly robbing Medicare of $716 billion…Look, here’s what really happened. You be the judge. Here’s what really happened. There were no cuts to benefits at all. None. What the president did was to save money by taking the recommendations of a commission of professionals to cut unwarranted subsidies to providers and insurance companies that were not making people healthier and were not necessary to get the providers to provide the service. …Now, when Congressman Ryan looked into that TV camera and attacked President Obama’s Medicare savings as, quote, the biggest, coldest power play, I didn’t know whether to laugh or cry—because that $716 billion is exactly, to the dollar, the same amount of Medicare savings that he has in his own budget. You got to get one thing—it takes some brass to attack a guy for doing what you did. Let’s look at the other big charge the Republicans made. It’s a real doozy. They actually have charged and run ads saying that President Obama wants to weaken the work requirements in the welfare reform bill I signed that moved millions of people from welfare to work. Wait, you need to know, here’s what happened. Nobody ever tells you what really happened — here’s what happened. When some Republican governors asked if they could have waivers to try new ways to put people on welfare back to work, the Obama administration listened…And the administration agreed to give waivers to those governors and others only if they had a credible plan to increase employment by 20 percent, and they could keep the waivers only if they did increase employment. Now, did I make myself clear? The requirement was for more work, not less. …I am telling you the claim that President Obama weakened welfare reform’s work requirement is just not true. But they keep on running the ads claiming it. You want to know why? Their campaign pollster said, we are not going to let our campaign be dictated by fact-checkers. Now, finally I can say, that is true. I couldn’t have said it better myself. The whole thing was vintage Clinton. There was plenty of detail in the speech, but it was all delivered with a wink and a chuckle while he stuck in the shiv. Republicans will dutifully attack back, but really, most of them are probably just shaking their heads and wishing they had someone like him in their party.